The 400th birthday of an undiscovered waterway will be celebrated at an event featuring an eclectic range of live music, comedy, theatre, food and wildlife walks. The New River, a historic watercourse that stretches from Hertfordshire to central London and flows through north-western Hackney, is often overlooked and remains invisible to most. But as part of the Hidden River Festival this Sunday people will be able to get rare glimpses of it. Although it is referred to as a ‘river’ the waterway is in fact only partly comprised of an ancient natural watercourse, while other parts are man-made. The man-made sections were constructed partly in response to concerns about waterborne diseases in order to bring fresh drinking water into London. 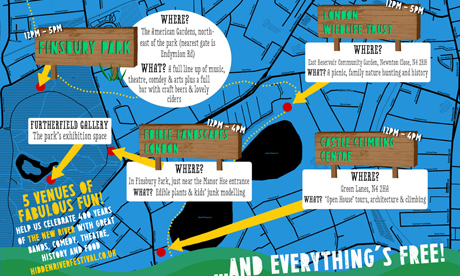 The festival will run from 12-5pm on Sunday 22 September and will feature a range of events across five different free venues surrounding Finsbury Park and Manor House. There will also be events in Clissold Park. One particular highlight will be the opening of the Castle Climbing Centre on Green Lanes, which was originally the old pump-house for the New River. Here it will be possible to go on a guided tour of the building and access sections which are not ordinarily open to the public. There will also be a range of wildlife walks along the New River and other green routes sites stretching through the New River ward of north-west Hackney. What’s more, in Finsbury Park the Big-Top stage will feature a teeming line-up of blues, jazz and live choral music, with performances from SwingPatrol and Keshco.